CAN-bus originally designed as a standard vehicle bus is now also used in other areas such as industrial automation medical equipment. factory automation industrial machine control maritime electronic building management system and aircraft control to mention a few. It is a message-based protocol using a serial communication method, it efficiently supports distributed real-time control with a very high level of security through its error process mechanisms and message priority concepts. The products offered here include:- CAN-bus Converters, Can-bus Repeaters, Can-bus Bridges and Gateways supporting CAN Bus (Controller Area Network). Many types of Can-bus adapter such as RS232 to Can-bus converters and Ethernet to Can-bus converters. Includes devices which support CanOpen and DeviceNet protocols. CANopen is an evolved communication protocol and device profile specification for embedded systems used in automation applications. Converts CAN-Bus Data to Fibre-optic (ST connection) to reduce the effects of electrical noise and harsh environments in Industrial applications. The I-7530 RS232 to CAN Bus converter makes it possible to connect a host PC/HMI Display into a CAN Bus Network. Similarly it can also allow standard RS232 devices to be connected to a CAN Bus Network. The I-7530A RS232,RS422 or RS485 to CAN Bus converter makes it possible to connect a host PC/HMI Display into a CAN Bus Network. Similarly it can also allow standard RS232 devices to be connected to a CAN Bus Network. The I-7531 is a CAN repeater used to establish a physical coupling of two or more segments of a CAN bus system. Users can implement tree or star topologies as well as extending the network distance. CAN Bus Bridge unit providing isolation and independence for each side of the CAN Network. Can also be used to extend a CAN-Bus network. CAN bus to Fibre Optic Bridge, allows for different baud rates on each CAN network, increasing of CAN transmission distance and improved error handling. Internet communications using TCP/IP is increasing in the industrial sector. Using Ethernet for networking in industrial areas is appealing because the required cabling is already installed. Modbus TCP/RTU or Ethernet to CAN bus Gateway module. The I-7565 is a cost-efficient device for coupling the CAN-bus to the PC using the standard USB interface. Nowadays the interface is present in every new PC and is supported by the MS-Windows 98, Me, 2000 and XP operating systems. The CAN-8123 (i-8KCPS1) main control unit is specially designed for the slave device of CANopen protocol. It follows the CANopen Spec DS-301 V4.01 and DSP-401 V2.1, and supplies and supplies many features for users, such as dynamic PDO, EMCY object, error output value, SYNC cyclic and acyclic etc. The CAN-8124 (I-8KDNS1) main control unit is specially designed to be a slave device of DeviceNet protocol. It follows the Specification of DeviceNet. The CAN-8223 (i-8KCPS2) main control unit is specially designed for the slave device of CANopen protocol. It follows the CANopen Spec DS-301 V4.01 and DSP-401 V2.1, and supplies and supplies many features for users, such as dynamic PDO, EMCY object, error output value, SYNC cyclic and acyclic etc. The CAN-8224 (I-8KDNS2) main control unit is specially designed to be a slave device of DeviceNet protocol. It follows the Specification of DeviceNet. The CAN-8423 (i-8421) main control unit is specially designed for the slave device of CANopen protocol. It follows the CANopen Spec DS-301 V4.01 and DSP-401 V2.1, and supplies and supplies many features for users, such as dynamic PDO, EMCY object, error output value, SYNC cyclic and acyclic etc. The CAN-8424 (I-8420) main unit based on the modular design provides its users with many good features and more flexibility in their data acquisition and control system. Gateway module that converts CANopen protocol to ModbusTCP or RTU, to allow connection across an ethernet or serial network back to a computer running a control/monitoring software package that communicates via Modbus. DCON protocol an application protocol based on the RS-485 network. It is designed for ICPDAS DCON I/O modules, such as I-7000 series and I-87K series modules. The I-7232D allows a CANopen master to access the Modbus slave devices on a Modbus RTU network. Modbus RTU protocol is a type of application protocol based on RS485 network. 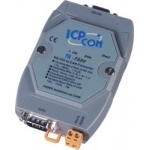 The I-7241D device provides a communication gateway between DeviceNet and DCON protocol. DCON protocol is the communication protocol of I-7K and I-87K series IO modules of ICP DAS. The I-7242D device allows a master located on a DeviceNet network to enter into a dialogue with the slaves on a Modbus RTU network. The I-7243D from ICP DAS is a solution that provides a communication protocol transfer the DeviceNet and Modbus/TCP protocol and solves a mission-critical problem: connecting an existing DeviceNet network to Ethernet-base PLCs and PC-based configuration and monitor system.